Kennedy Space Center Visitor Complex is treating guests to an out-of-this-world holiday experience with an all new Holiday Rocket Garden Light Show, part of the attraction’s annual “Holidays in Space” celebration. 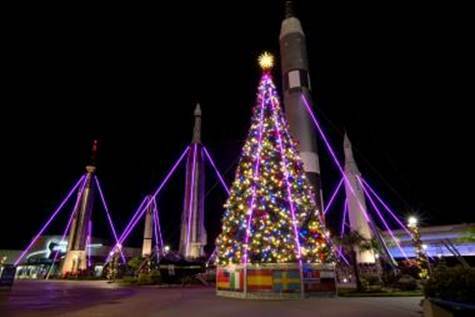 CAPE CANAVERAL, Fla.– Kennedy Space Center Visitor Complex is treating guests to an out-of-this-world holiday experience with an all new Holiday Rocket Garden Light Show, part of the attraction’s annual “Holidays in Space” celebration. The new Holiday Rocket Garden Light Show takes place daily through Jan. 4 in the ever-popular Rocket Garden, a Visitor Complex hallmark. The outdoor garden features a majestic collection of real and replica capsules and rockets, soaring 80, 90, and 100 feet into the sky, demonstrating how manned space flight progressed through the Mercury, Gemini and Apollo eras. The Visitor Complex also is adorned for the holiday season with a stunning array of decorations including a 41-foot Christmas tree, a giant NASA “meatball” ornament, garlands, lights, ribbons, bows and more. A second element will be added to Holidays in Space Dec. 22 through Dec. 30 when a 3D projection mapping presentation will be shown on the side of the 223-foot-long Saturn 1B rocket. Also called spatial augmented reality, this technology is used to project images onto irregularly shaped objects, such as bridges, buildings, and now, a rocket. This remarkable presentation, a first at Kennedy Space Center Visitor Complex, features custom animation blended with historic footage of actual launches and awe-inspiring views of Earth from the ISS. The show takes guests on a walk through NASA history, from the first moon launches, through the 30-year Space Shuttle Program and the assembly of the ISS, and onto the surface of Mars, thanks to actual images captured by NASA’s robotic exploration rovers. From Dec. 26-Dec. 31, a Holiday Laser Light Spectacular will be added to the festivities, featuring an incredible music and laser light show that will be visible in Orlando and throughout Central Florida. The green rays from the laser show may even be bright enough for crew aboard the International Space Station to see. All holiday activities are included with Visitor Complex admission; no advance reservations are required. Light shows begin at dusk each day. The Visitor Complex is open 365 days a year, including Christmas Day, Dec. 25. Nov. 28-Dec. 25: 9 a.m. to 6 p.m.
Dec. 26-Jan. 4: 9 a.m. to 7 p.m.
Kennedy Space Center Visitor Complex brings to life the epic story of the U.S. space program, offering a full day or more of fun and educational activities, including the Kennedy Space Center Tour featuring the Apollo/Saturn V Center with an actual Saturn V moon rocket, Shuttle Launch Experience®, 3D IMAX® space films, Astronaut Encounter, Exploration Space®: Explorers Wanted and many other interactive exhibits. The new $100 million home for Space Shuttle AtlantisSM opened June 29, 2013. Admission also includes the U.S. Astronaut Hall of Fame®, featuring historic spacecraft and the world’s largest collection of personal astronaut memorabilia, which opens daily at noon and closing times vary by season. Only 45 minutes from Orlando, Fla., Kennedy Space Center Visitor Complex opens daily at 9 a.m. with closing times varying by season. Admission is $50 + tax for adults and $40 + tax for children ages 3-11. The Kennedy Space Center Visitor Complex offers annual passes starting at $75 + tax for adults and $60 + tax for children ages 3-11. For more information, call 877-313-2610 or visit http://www.KennedySpaceCenter.com. 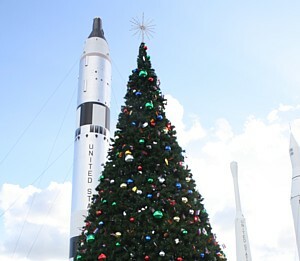 3rd Annual ‘Holidays in Space’ at Kennedy Space Center Visitor Complex takes place Nov. 29-Jan 5. From Nov. 29 through Jan. 5, Kennedy Space Center Visitor Complex celebrates the third annual “Holidays in Space.” The Visitor Complex will be adorned with a stunning array of holiday decorations, host daily visits with Santa and Mrs. Claus and spark the imagination with the new “Through the Toy Box: An Out-of-this-World Collection,” featuring toys, both vintage and contemporary, inspired by outer space. From ray guns and space ships to coin banks and cosmic action figures, “Through the Toy Box: An Out-of-this-World Collection” represents mankind’s fascination with space over the last 100 years in the form of toys. The collection features nearly 100 treasured toys children have used to play out their fantasies of space travel, some of whom turned those dreams into reality. The compilation of space-themed toys from around the world will be displayed in IMAX East alongside Santa and Mrs. Claus. Sitting on beautiful gold thrones and surrounded by a gorgeous Winter Wonderland scene, Santa and Mrs. Claus will greet visitors daily from Nov. 29 through Dec. 24. Each day, the first 200 children to visit Santa will receive a voucher for a free gift. In addition, Kodak representatives will be on hand to snap the perfect family photo, sitting with Santa and Mrs. Claus, and provide prints for sale. “Holidays in Space” wouldn’t be complete without festive space-themed décor throughout the Visitor Complex. A towering, 42-foot International Space Station (ISS)-themed Christmas tree located in the Rocket Garden will be adorned with warm-white bulbs, strobe lights and 600 miniature flags from the 15 ISS partner countries. The ISS mural just outside the Rocket Garden will be swathed in holiday candlelight. Decorative wreaths, garlands, lights, ribbons and bows throughout the Visitor Complex add to the holiday festival atmosphere. “Holidays in Space” is included in admission to Kennedy Space Center Visitor Complex. Souvenir photos with Santa and Mrs. Claus are available at an additional charge. For more information or to purchase tickets, call 877-313-2610 and visit www.KennedySpaceCenter.com.